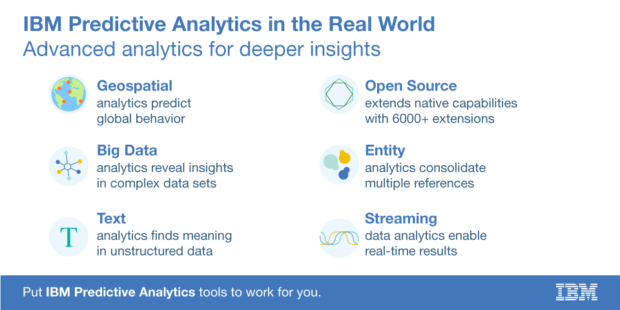 IBM is using the latest, most advanced predictive analytics techniques to help organizations like yours on the journey to big insights. These include geospatial, text and entity analytics. Geospatial analytics uses geospatial data—longitude and latitude. While many firms have access to this data, few have been able to leverage it to glean helpful business insights. One example of an industry that is taking full advantage is Law Enforcement, who is using it to predict where and when crime will happen. Other industries that can find value in geospatial analytics are healthcare, retail and non-profits, to name a few. IBM is one of the first to use geospatial in predictive analytics. In addition to geospatial analytics, IBM offers text analytics which looks at unstructured data. 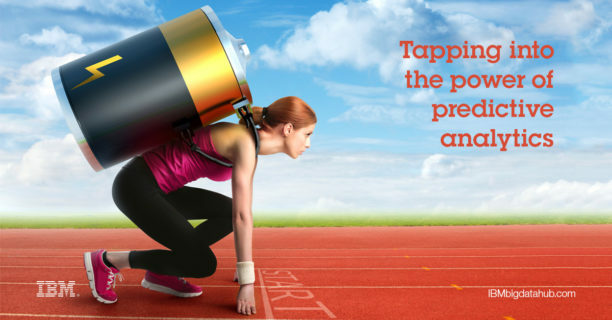 Unstructured data is information that isn’t organized in a pre-defined manner. It’s often text-heavy but could contain dates and numbers. For example, when you call the cable company you hear them taking notes. The data that they’re gathering is unstructured – it’s not grouped into any category. Text analytics takes unstructured data and puts it into categories. Now if you call the phone company to tell them that your phone is not working, it can be grouped into categories. You might say you have poor phone reception, or are experiencing dropped calls. This software finds the value in unstructured data, the sentiment and meaning behind it. Then IBM uses it to make further predictions. In this case, if this cell phone company wants to know the likelihood of retaining a customer who has had five dropped calls in a particular area, IBM’s software can mine through their text data, categorize and analyze it and use it for predicting, acquiring customers and improving overall customer service. Entity analytics allows you to look at the many different ways an entity is refereed to—an entity being a person, a company, a product, thing or event. An example is: my name is Jennifer Galvan. This person can be referred to as Jennifer, Jenny, J., Galvan, or by rank. There are many combinations of names, ranks and locations. This person may be in the database ten different ways. With entity analytics, you look at all this data as one person, not ten. IBM has a variety of innovative analytics techniques beyond geospatial, entity and text analytics. Looking to really expand? Take advantage of IBM’s active and growing open source community leveraging best-of-breed software for total solutions. IBM now has 6000 extensions, and utilize “R”, one of the main open source languages used in analytics. IBM® SPSS® Modeler: Build and deploy predictive models directly into your business processes for the right decisions every time. Entity analytics, big data analytics and predictive techniques are key themes. For higher volumes of entity analytics, consider IBM® Entity Analytics Unleashed, which can handle larger amounts of data. 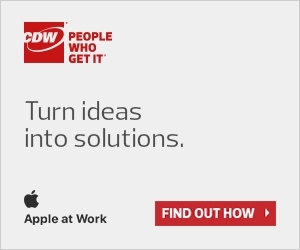 Contact your CDW account manager to connect you with the right experts to get Predictive Analytics working for your organization today! Previous articleSMISHING & GREYWARE: Come again? Next articleWAR-DRIVING: Coffee goers beware! EVERY MASTERPIECE HAS A GREAT BEGINNING: Introducing Cyber SITREP!